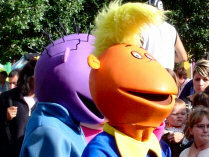 The Tweenies show closes its doors for the last time this season. Three years after opening its doors in Cred Street, the Tweenies Theatre, which has entertained many thousands of younger Alton Towers visitors, is set to drop curtain for the last time on October 30th. The theatre is set to be replaced by an unconfirmed laser show billed as spectacular. It is speculated that this 'Laser Spectacular' could be developed by American company Falcons Treehouse, who brought attractions like Twister: The Ride and some interactive elements in Disney theme parks.